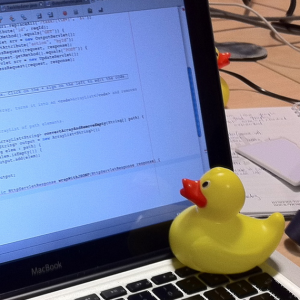 Mobile App Developers, Have You Heard of Rubber Duck Debugging? To my fellow mobile app developers, have you ever found yourself spending way too much time tracking down a bug in your code? After exhausting all possibilities and running around in circles, you finally admit defeat and call in a co worker to aid in your quest. But then something strange happens, as you start walking your co worker through the problem, the solution becomes blindingly obvious. Embarrassed, you end up thanking the for their time and send them on their way. A colleague’s time is expensive, but Rubber ducks are free (well almost free; $5.89 on amazon). Simply place your rubber duck on the your desk. When you find yourself faced with a difficult bug, turn him towards you and start explaining the problem. Step through the code explaining it line-by-line. Your duck will sit and listen attentively as your in depth analysis starts to shed light on where you have gone wrong. If you don’t like ducks, this technique can of course be done with any inanimate object. Not only does it make you more productive when developing your mobile apps, it also makes it more fun! Rhett has 10 years of experience developing software. He believes that an app is a marriage of functionality and beauty as should be the underlying engine which drives it.